On-the-job research is critical to developing products that meet workers' needs. Do you mind if we watch you work? In today's fast paced and ever-changing manufacturing environment, the "personal" aspect of personal protective equipment (PPE) is more important than ever. The process of researching, developing, and manufacturing new products must go full circle, beginning and ending with the workers who wear PPE to perform a variety of tasks day after day. Many PPE manufacturers claim they design protective products that meet specific end user needs. However, few actually invest the time and effort required to travel to individual job sites and conduct the research necessary to fully understand worker challenges and needs. So how can PPE manufacturers regain this critical focus on the end user? Ethnography is the term applied to this field study strategy. It revolves around the idea that human beings are best understood when they are studied in their everyday environment — in this case, their work environment. Researchers must be able to pinpoint any change or adjustment individuals make while accomplishing daily tasks and understand their motivations and responses. A trained observer will ask the right questions and identify issues that even the worker may not consciously recognize. During research at one construction site, for example, an HVAC technician who wore standard leather gloves indicated he needed a product that would protect him from sharp-edged materials, such as metal. He did not mention that he required gloves that would enhance his dexterity, even when the researcher questioned him. Yet when the researcher studied the employee in his work environment, he noticed the individual removed his gloves every time he had to handle small objects, such as nuts and bolts. industry with extraordinary comfort and dexterity to eliminate the frustration that had historically discouraged construction workers from wearing their gloves all day long. Illustration 1. The observation process starts with the dynamic work environment, where new equipment, processes, and technology often result in unmet worker needs. Illustration 1 demonstrates this process, beginning with the dynamic work environment, where new equipment, processes, and technology oft en result in unmet worker needs. On-the-job evaluation creates the opportunity for trained researchers to observe workers in action and to give them the opportunity to voice their frustrations. The next step, product development, includes a foundation of materials science, as well as newly developed laboratory testing that replicates real life situations, followed by end user evaluation of the prototypes and implementation of any change and adjustment that is needed, based on this feedback. These efforts culminate with the production of PPE products that keep workers safe, improve morale, and enhance productivity. Research confirms workers feel comfort is just as important in PPE products as protective qualities. Glove manufacturers can design a product that offers as much cut or abrasion resistance as a rock, but if the gloves do not offer a sufficient level of comfort, workers will refuse to wear them for long periods. In the sugar cane industry, employers provided workers with extremely large cut-and-sewn gloves that included a braided wire sewn into the product to protect against the cuts and amputations that occasionally resulted from the machetes used by workers during the harvest. Aft er watching workers cut sugar cane in the field all day, researchers learned both cut and comfort were primary issues. As a result, the glove manufacturer developed a product made with yarn reinforced with a fine wire. 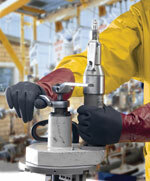 The new gloves protected workers' hands against serious injury by providing improved cut resistance in all areas. The improved gloves were comfortable and breathable, and they fit better than the product the workers previously wore. Additionally, the gloves were launderable, which extended their service life. Gaining worker input was essential in the development of Ansell Grip Technology™, which has been incorporated into several next-generation glove products. Comprehensive analyses conducted at more than 1,000 workstations within 50 major manufacturing industries in Europe revealed 89 percent of workers felt they needed hand protection products that would improve their ability to securely grip objects in wet and dry environments. Photo 1. Ansell Grip Technology™, which includes a roughened surface comprising microscopic channels in a patented ultra-thin nitrile coating that directs fluids away from the grip surface. In many applications, lack of grip created a serious safety hazard because workers sometimes dropped objects that caused cuts and other injuries, even damaging expensive equipment. Musculoskeletal disorders such as carpal tunnel syndrome were a problem because employees had to exert greater force in order to maintain a secure grip. The need for grip assistance resulted in Ansell Grip Technology™, which includes a roughened surface comprised of microscopic channels in a patented ultra-thin nitrile coating that directs fluids away from the grip surface (Photo 1). The result is a relatively dry contact area that allows workers to maintain almost the same grip in oily applications as in dry conditions. As workers' PPE needs change within various industries, product testing methods must be modified in order to effectively evaluate new products. In the United States, the International Organization for Standardization (ISO) has adopted the American Society for Testing and Materials (ASTM) method F1790 as an international standard for evaluating glove products. The method assesses product properties that hinder a sharp-edged device from entirely penetrating through a material or combination of materials. In the European market, gloves are evaluated according to EN 388, which is the mandatory performance standard for gloves as regulated by the European Committee for Standardization (CEN). The method employs a constant weight on a circular blade that the test machine moves back and forth across a specimen. The machine rotates the blade against the direction that it is being moved, which intensifies the slicing motion. While data obtained from these test methods can be helpful when comparing the cut resistance of some materials, the tests may not sufficiently replicate real life situations. A construction worker, for example, may inquire how gloves with an American National Standards Institute (ANSI) level 4 cut resistance rating will perform when he or she handles sheet metal. Photo 2. A guillotine-type piece of equipment was used to support development of the sugar cane glove product. Laboratory tests for evaluating new PPE products should evolve as part of the product development process and result from worker input. Photo 2 shows a guillotine-type piece of equipment that was used to support development of the sugar cane glove product. The equipment mimicked a "misguided" sugar cane machete and helped researchers understand the level of cut resistance required to protect workers laboring in the fields. While this test method is not standard, it helped complement standard ASTM 1790-05 and EN 388-6.2 cut testing by replicating real-life scenarios. Of course, material properties such as cut resistance, tear strength, abrasion resistance, grip, and dexterity are all important aspects of cut protection. Other factors unrelated to protective apparel may also affect cut protection, including machine guards, workplace set-up, working conditions, and worker training. Photo 3. A dexterity test is used to verify a gloved user's ability to pick up small nuts and screw them onto a threaded steel shaft. While product testing should mimic onthe- job situations, the tests do not have to be complicated. Photo 3 depicts a dexterity test used to verify a gloved user's ability to pick up small nuts and screw them onto a threaded steel shaft. Users may attempt the test with various gloves to compare the length of time it takes and the ability of the user to accomplish the tasks. This test may be conducted in a dry or oily environment, with nut/shaft sizes varying from a very large diameter to a much smaller size. A bare hand may be used to provide a baseline measurement for comparison. Companies and workers have many choices when they select PPE. Quality products that provide the level of protection needed, however, must be preceded by job site visits that enable trained researchers to identify application-specific hazards and gain workers' input about the challenges they face and the frustrations they experience every day. Effective PPE products also will incorporate "personal" features, such as comfort, dexterity, and flexibility, to help ensure end users can confidently perform a variety of tasks when they wear PPE products for the duration of their work. While product development efforts must begin with worker input, they should conclude with feedback and testing that replicate real-life applications to verify products will truly protect workers in the intended applications.